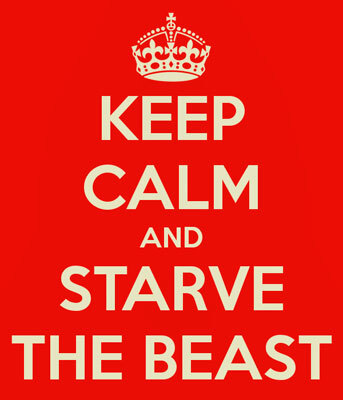 A term coined in 1985 by an unnamed staffer of the Reagan administration was “Starve the Beast”. This referred to a fiscally conservative political strategy to cut government spending by paying less in taxes. So, in the original sense, “the Beast” was the government, and people were to starve the beast by spending less and using loopholes, therefore paying less in taxes. These days the Beast has a lot more tentacles than just the government. Perhaps it’s time for another financial revolution - one where people group together and use the power of the boycott to starve all the arms of this Beast that would swallow us whole. If we vote with our dollars, eventually there will, of a necessity, be a paradigm shift that returns us to simpler days, when families that were willing to work hard could make a living without selling their souls to the corporate monoliths. Every penny you spend with small local businesses is a penny that the big box stores won’t have. Everything that you buy secondhand or barter for is an item on which you won’t pay sales tax. Disassociate yourself completely with “the system” that is making Western civilization broke, overweight and unhealthy.